(Branson – September 5, 2018)– FIFI, the Commemorative Air Force’s (CAF) iconic Boeing B‐29 Superfortress, returns to the Branson Airport, September 19-23 for the AirPower History Tour. FIFI is one of only two remaining airworthy B-29s in the world and is the only one that flies regularly. Additional historic airplanes that are part of the tour, available for rides, will be a P-51 Mustang, C-45 Expediter, T-6 Texan, Boeing Stearman, a PT-19 and others. These aircraft are powerful history lessons bringing the sights, sounds and stories of World War II aviation history to audiences across the United States. Event goers may tour the B‐29, as well as purchase rides in all of the planes. The planes will be on display at the Branson Airport Jet Center, 130 Wright Brothers Road in Hollister, Missouri. A portion of the event proceeds will benefit, locally, the Branson Veterans Task Force and the Civil Air Patrol’s Cadet programs for area students. “This is the not only an opportunity to appreciate some magnificent planes, but to gain a little more perspective on the sacrifices made by pilots and crews who flew them. Alone, the aircraft are a beautiful sight to see, but it’s important to remember these planes were put in the hands of crews averaging 23 years of age. When given the task, these young airmen changed history. For this we should all be thankful and remember their brave service and sacrifice.” Commented Tom Forster, Board Member of The Branson Veterans Task Force. 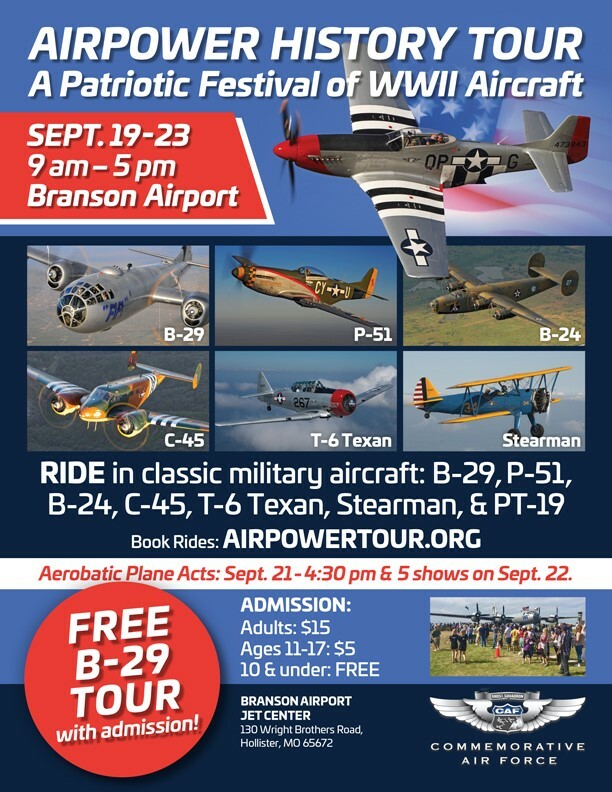 The AirPower History Tour is open to the public at the Branson Airport Wednesday, September 19 through Sunday, September 23, from 9:00 a.m. to 5:00 p.m. Admission (donation to CAF 501 c3) for ramp access is $15 Adults, $5 age 11 to 17. Children age 10 and under are free. Price includes free tour of “FIFI”, the B-29 Superfortress when she is not flying. All other airplanes will be on static display for viewing. Plane ride prices range from $85 to $1995. Reservations may be made at www.AirPowerTour.org as well as at the ride desk during the event. Additional activities (subject to weather) include Aerobatic Stunt Plane Acts on Friday at 4:30 pm and all-day Saturday. Food, beverage and games will be available on site. FIFI was acquired by the CAF in the early 1970s when a group of CAF members found her at the U.S. Navy Proving Ground at China Lake, California where she was planned to be used as a missile target. The airplane was rescued and restored and has traveled coast to coast for 43 years attracting large crowds at every tour stop. Learn more about FIFI and her tour schedule at www.AirPowerTour.org. Collecting, restoring and flying vintage historical aircraft for more than half a century, the Commemorative Air Force ranks as one of the largest private air forces in the world. The CAF is dedicated to Honoring American Military Aviation through flight, exhibition and remembrance. A non-profit educational association, the CAF has more than 11,000 members and a fleet of 160 airplanes distributed throughout the country to 70 CAF units for care and operation. For more information, visit www.commemorativeairforce.org.